By turning to face Jerusalem, we express to God our desire to step into line with his plans and purposes in this world. About 120 Jewish men and women, followers of Yeshua of Nazareth, gathered together in Solomon’s Colonnade, under the shade of its cedar beams. They assembled for prayer in the Temple Courts alongside Jews from all over the world in honor of the biblical festival called Shavu’ot, or Pentecost. Following Yeshua’s command, these disciples had remained in Jerusalem after his ascension. It was there that they received the gift of the Holy Spirit. In Jerusalem, they were transformed from a small band of disciples into a true ekklesia (assembly). Just before his ascension Yeshua told his followers that they would be his witnesses in Jerusalem, in all of Judea and Samaria, and to the ends of the earth (Acts 1:8). Notice how Yeshua himself envisions the world with Jerusalem at its center. Jerusalem is mentioned no less than fifty-eight times in the book of Acts alone. The followers of Yeshua met regularly in Solomon’s Portico, an area within the Temple courts. And even as the message spread across the region, Jerusalem remained the home base of the apostles. Paul would collect donations from other communities of believers and bring them to the apostolic community in the holy city. 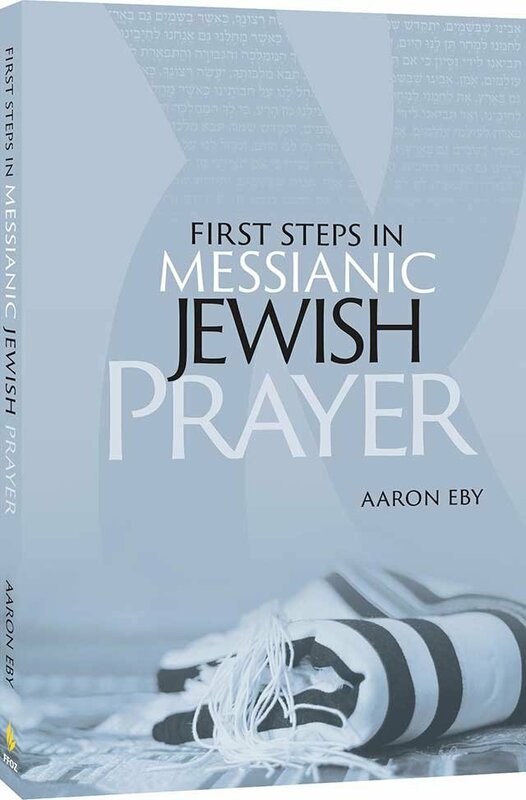 Like other Jews, first-century followers of Messiah faced Jerusalem when they prayed. It represented for them the hope of redemption and the return of Yeshua. As the community of Yeshua’s followers began to distance itself from its Jewish roots, reverence for Jerusalem was lost. Instead of facing Jerusalem in prayer, Christians began to adopt the more universal custom of simply facing east regardless of location. This is the custom among Orthodox Christians to this day. 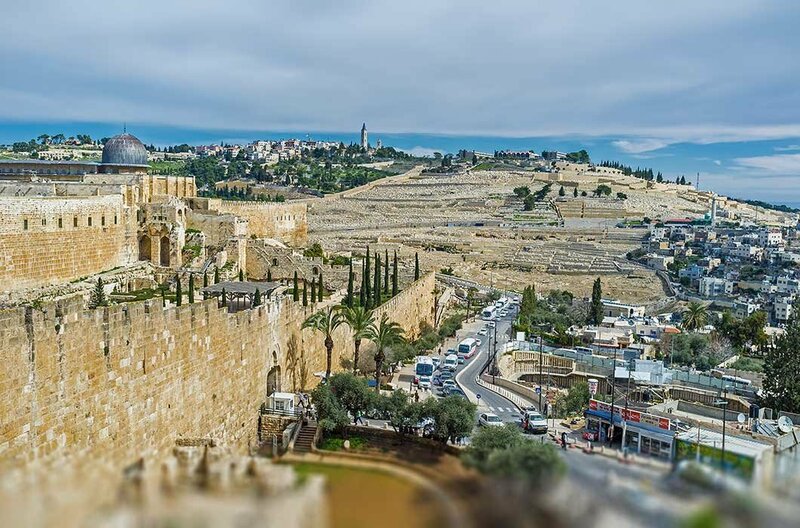 But today, more and more Christians are recognizing Jerusalem as the “apple of God’s eye,” knowing that this is the place of Messiah’s glorious return. It makes sense to stand in solidarity with the Jewish people today and return to the ancient practice. Why turn to face a physical place? Didn’t Yeshua say to the Samaritan woman that true worshipers will worship the Father in spirit and in truth (John 4:23)? Isn’t the present Jerusalem “in slavery,” while the Jerusalem above is “our mother” (Galatians 4:25-26)? Doesn’t the body of Messiah now constitute the Temple and dwelling place for God by the Spirit (Ephesians 4:22)? In Galatians, Paul contrasts the “present Jerusalem” with the “Jerusalem above.” This is not a new idea that originated with Paul. 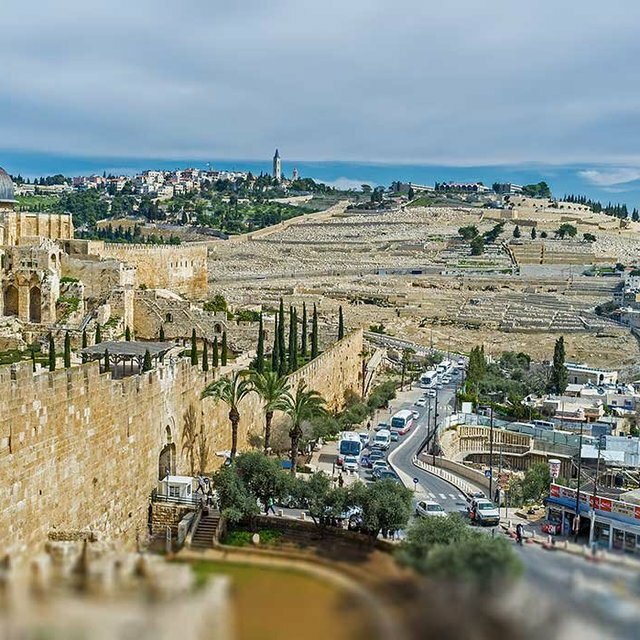 The ancient rabbis also knew and talked about the “Jerusalem above.” This in no way minimizes the importance of Jerusalem—actually, it emphasizes it. After all, how many cities are there that have a heavenly version? This just shows that our Jerusalem on earth is a physical representative of a tremendous spiritual reality. Similarly, the concept of a spiritual Temple did not originate with Christianity. For example, the ancient rabbis looked closely at the verse, “And let them make me a sanctuary, that I may dwell in their midst” (Exodus 25:8). In Hebrew, this verse can also be understood as “They will make me a sanctuary, but I will dwell within them.” In other words, God’s faithful people have always constituted a dwelling place for his Spirit. This illustrates an important concept in a Jewish frame of mind: physical and spiritual realities can exist simultaneously. The heavenly tabernacle already existed before God commanded Moses to build one on earth; the heavenly tabernacle was the “pattern” that God showed him on the mountain (Exodus 25:9). One does not negate or obviate the other. If you don’t know which way is Jerusalem, or if it is just not practical for you in your time and place, then don’t worry. We are not praying to Jerusalem; we are praying to our Father in heaven. Direct your heart toward him. There is nothing magical about facing a certain direction in prayer. God could hear our prayers even if we were speaking into a hole in the ground! And it certainly has no bearing on our salvation. And yet, prayer is communication. Communication not only exists in the word we speak, but also in body language. Think of what it conveys when a person faces away from you while speaking, or when someone’s eyes are darting elsewhere. What would that kind of distraction look like in prayer? By turning to face Jerusalem, we express to God our desire to step into line with his plans and purposes in this world. We show that he has our full attention. We communicate that we are eager to see Messiah return. When Christians turn their hearts and faces toward the holy city, anticipating its redemption and transformation through Messiah, they stand in unity with our Jewish brothers and sisters all across the world. They unite with countless generations of Jewish people going back to the earliest followers of Yeshua.